UPDATE: This event is SOLD OUT. You may still call to be placed on the waiting list. Guest rooms are still available! 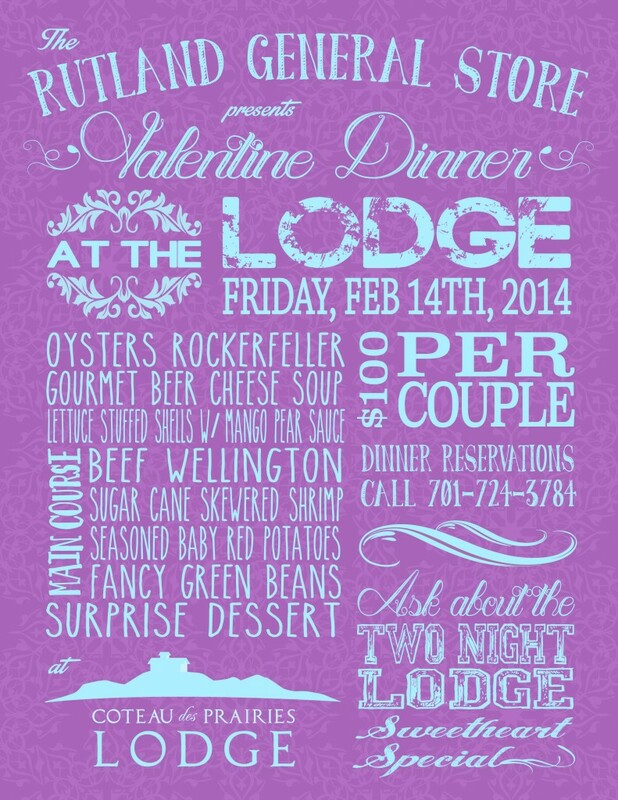 This year, Coteau des Prairies Lodge is hosting The Rutland General Store’s Valentine Dinner! The Lodge is featuring a Sweetheart Special to go along with the dinner. This special includes a two-night stay at Coteau des Prairies Lodge and a bottle of champagne for $200. * Guys, this is your chance to do something special for your gal! Coteau des Prairies Lodge is on the official list of 8 Legendary Places for a Romantic Getaway in North Dakota. *This price does not include the Valentine Dinner.